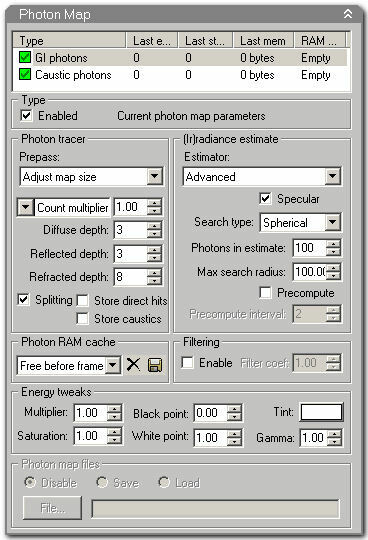 Summary: This page lists most of the options that are available in the Brazil for Rhino plug-in. There is a brief explanation of the purpose and effects of each one. Since Brazil for Rhino is not complete, some options are not yet implemented. You can open the Brazil options dialog via the Brazil menu, in which case you get a modeless dialog. It is also possible to access the options in a modal way through the regular Rhino Options dialog. The options are grouped in categories, in which each is represented by a collapsable frame. The UI is similar to the Brazil implementation in 3D Studio Max . This page is a loose reference, not a sales brochure. If you do not yet have a copy of Brazil running, you're probably better off reading the Brazil features page. Note: These settings all refer to the properties of the Brazil render engine, not to the properties of objects and lights. Light and Object settings can be reached through the standard Object Property Dialog in Rhino. Brazil does not render an image in one go. Instead it divides the entire image into a grid of square buckets, each of which is solved individually. These buckets can have different sizes and can be processed in a specific order. They can be distributed over a network, so that multiple computers can render into the same image by completing their assigned buckets. The General options allow you to adjust the progression of a rendering. The Bucketing options frame shows three different properties of the bucket server: Bucket Size, Bucket Order, and Bucket Interlacing. In practice, the bucket size is defined in pixels and this setting makes little difference. Small buckets render faster, but there are more of them so the rendering time at large isn't affected. However, if you're running a complex rendering you may want to switch to smaller bucket sizes to get a more frequent visual update of the progress. Note that pixels near the bucket edges are slightly harder to solve correctly than interior pixels. This means that renderings made with small buckets tend to have more bucket artifacts than renderings made with large buckets. But the sampling in Brazil is very good and bucket artifacts only occur under special conditions anyway. Bucket Order and Interlacing refer to the sequence of buckets in the queue. Several different orders are possible (Hilbert, Top-to-Bottom, Left-to-Right, Center-out and Random). Each one can be reversed (by pressing the R button next to the order box). So, for example, you can also get Right-to-Left. These settings are fairly straightforward and self-explanatory. The Output Size options should not shock you. They are fairly similar to all other rendering engines. You can set dimensions and ratios. By default the rendering has the same dimensions as the active viewport, but you can override this behavior. You can either specify a custom dimension or pick a preset. As soon as you do not use the viewport size, or an exact multiple of the viewport size, the preview you get in Rhino will no longer match the ratio of the rendered image. You can enable the Safe Frame to see what part of the viewport will end up being rendered. Safe Frame options are located in the document properties. The View options control the behavior of the virtual camera. Apart from a resolution (which is controlled via the Output Size options) and a shutter speed (which can be accessed via the Motion Blur options), the camera has a certain lens-type and a depth of field. Brazil currently comes with four different lenses: Perspective, Spherical, Orthographic, and Panoramic. The Perspective lens behaves the same as the Rhino perspective viewport, meaning you get a three-point perspective projection. This is technically an impossible projection, but our brains accept the illusion with a long enough lens-lengths. On the other hand, a Spherical projection is physically correct, because it uses a six-point perspective (two vanishing points for every axis instead of just one). The upshot of this is that straight lines in space become curved under most conditions which makes it less useful for a CAD modeling environment. With short lens-lengths the spherical projection starts to behave as a Fish-eye lens. Note that since the spherical projection cannot be represented in the viewport, you cannot use the Rhino view to accurately position the camera. An Orthographic projection in Brazil is the same as a Parallel viewport in Rhino. The Depth-of-Field options let you specify settings that introduce an imperfection which makes the virtual camera behave more like biological eyes and photographic lenses. In physics, a lens system always has a focus distance, at which the image is at its greatest crispness. Any objects which are closer to or further away from the camera than this focal distance start to become blurry. For a more in-depth description of the DOF implementation in Brazil see this wiki page. These options are self-explanatory. Note that checking these boxes will affect the way in which the Rendered Viewport behaves in Rhino. Also, the wireframe is not automatically superimposed onto the rendering. You have to enable it after the rendering finishes via the Post-Effect panel. This is one of the most important features of Brazil, one that must be mastered (or at least well understood) by professional users. I highly recommend you read the Brazil Rendering System Sampling on this wiki. When the sampling is set too high the rendering will progress slowly without a clear increase in image quality. 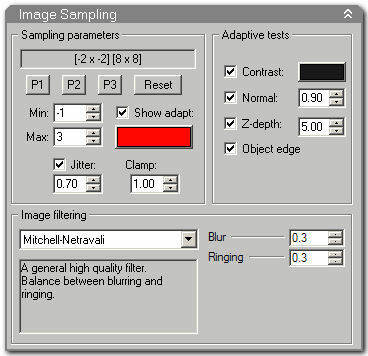 If the sampling is too low then the image will become grainy or blurry when certain conditions are met. 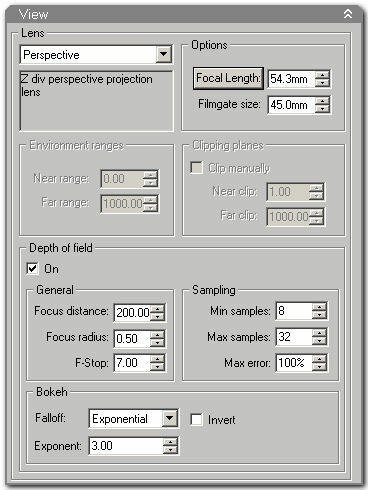 The Sampling parameter frame specifies the minimum and maximum allowed sampling densities. There are three defaults: P1 (Preview), P2 (Medium), and P3 (Production). The Adaptive tests frame gives you control over the fine-tuning of adaptive thresholds which control when Brazil switches from minimum sampling to maximum sampling. Motion Blur only works when the Bongo animation plug-in for Rhino is installed. When you have moving objects in your scene, Brazil can ask Bongo where objects are headed and where they came from. The direction and speed of objects is then combined with the camera shutter speed to calculate the region of space which the moving object occupies for the duration of a single rendering (the shutter time). 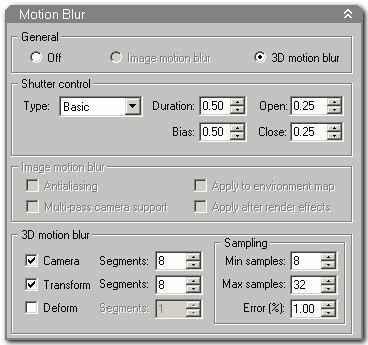 Motion blur can be enabled for moving objects but also in case you have a moving camera (in which case all objects have a speed relative to the camera and all objects are rendered with motion blur). The Ray Server is the engine in Brazil which takes care of all the ray-casting and intersections. Here you can control how accurate reflections and refractions are calculated. If you have a scene with two parallel mirrors, any photon (ray) caught between them may theoretically bounce any number of times before terminating. However, only the first few bounces contribute vital data to the final color of the pixel in question, so there's usually no need to refine the reflection ad infinitum. 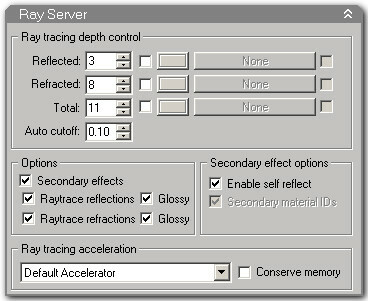 The default settings usually suffice for normal scenes, but if you have a model with large amounts of glass and mirrors, you may have to increase the ray-depths for reflection and refraction. You can also specify an exit-color which will override the color in the ray-tracer when a threshold is reached. The default is not to override. The Luma Server is also an extremely important category, one that you must become comfortable with to get the most out of Brazil. The Luma Server is all about light and how it propagates through the scene. Note that light objects also have a myriad of settings which influence the behavior of individual lights (shadows, decay, attenuation, projection etc. ), but the Luma server is about scene lighting. The General frame allows you to enable or disable shadow casting and the default light. The default light is only used when you have not specified any light source objects in your scene. Without any light sources the rendering will become completely black. But it is possible that you have defined materials which cast photons into the scene, in which case you may want to uncheck the default light. Direct illumination is the simplest possible lighting scheme. In direct lighting, every rendered point in the scene checks how many lights are visible from its location. Every light which is visible contributes to the brightness of the sample. 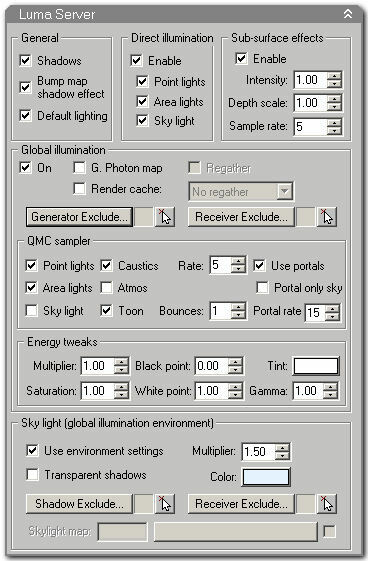 Point and Area lights are represented by Light objects in the Rhino model, but the Skylight is a purely virtual construct derived from the Environment settings in Brazil. The settings for the behavior of the Skylight are located at the bottom of the Luma Server dialog. Indirect illumination is a more advanced lighting scheme which also takes lit geometry into account. See the feature page for further details. Since Indirect Illumination is potentially an endless process, there are many tricks to short-circuit a calculation and get a premature, but accurate, result. This requires a fair understanding of how GI works. This is not the place for such an essay, see Wikipedia for a more in-depth discussion. 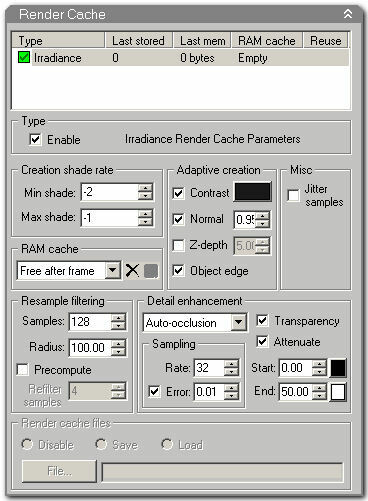 The Render Cache is a method to reduce the large overhead of a GI rendering, by performing an indirect only prepass at low resolution, and then using that image to control the illumination of the final rendering. This, too, is a complex topic and I will not discuss the details here. Essentially, one of the biggest advantages of using an Irradiance Cache is that is can be saved (cached) between renderings, thus drastically decreasing the render time for animations. 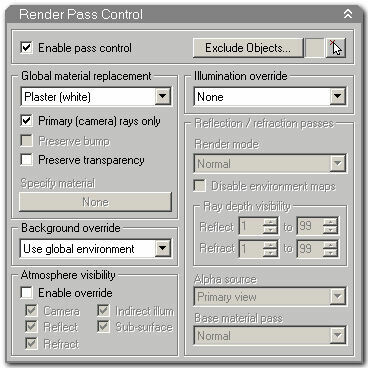 The Render Pass Control options allow you to override several settings before rendering. If you have defined a scene with complex materials (lots of reflection, lots of refraction, sub surface scattering and so on and so forth) it will take a long time to render. But if you're only interested in camera location you do not want to render the scene at full complexity, because you only want a quick indication of the perspective distortion or the object occlusion. In the Render Pass controller you can assign simple materials to all objects or override lighting schemes without losing your actual settings.